Frugal GM has told us of a city map generator and it’s free (I initially thought he wrote it which is why the title of the blog is still that way). Wait what? What is it? The Roleplaying City Map Generator comfortably creates maps of any kind of settlement, such as villages, medieval towns, or 20th century big cities, in few minutes requiring only a couple of mouse clicks. 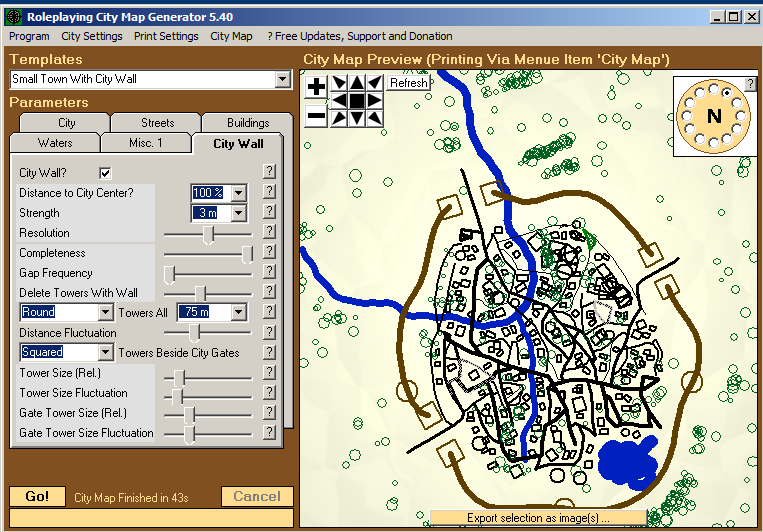 You define the values of various city parameters, either manually or via pre-defined or own templates – The Roleplaying City Map Generator randomly creates realistic maps which can be printed or exported as image also as matrix or section. Ok, but what does it look like? How did I not know of this? Godlike. Awesome. Praise be. Why? Because a quick shot map of a city is far better than just using words. Players can get a feel, even if that feel proves rough, this is so much more awesome than using generic stuff.